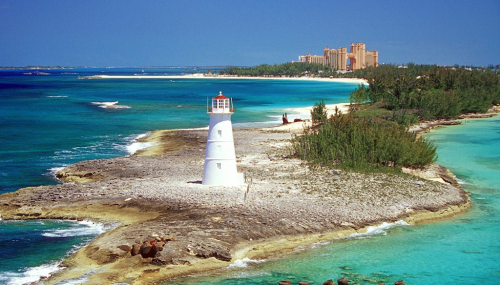 Bahamas is a nation consisting of 29 islands, 661 cays, and 2,387 islets. It is located in the Atlantic Ocean north of Cuba and Hispaniola, northwest of the Turks and Caicos Islands, and southeast of the United States. Its land area is 13,939 square kilometers, with an estimated population of 330,000. Its capital is Nassau in the island of New Providence. Originally inhabited by the Lucayans, Bahamas were the site of Columbus' first landfall in the Americas in 1492. Although the Spanish never colonized Bahamas, they shipped the native Lucayans to slavery in Hispaniola. The islands were mostly deserted from 1513 to 1648, when English colonists from Bermuda settled on the island of Eleuthera. The Bahamas became a Crown Colony in 1718 when the British clamped down on piracy. Following the War of Independence in the United States, thousands of pro-British loyalists and enslaved Africans moved to Bahamas and set up a plantation economy. The slave trade was abolished in the British Empire in 1807 and many Africans liberated from slave ships by the Royal Navy were settled in Bahamas during the 19th century. Slavery itself was abolished in 1834 and the descendants of enslaved and liberated Africans form the bulk of Bahamas's population today. The nation became independent on 1973. The closest island to the United States is Bimini. The island of Abaco is to the east of Grand Bahama. The southeasternmost island is Inagua. The largest island is Andros Island. Other inhabited islands include Eleuthera, Cat Island, Long Island, San Salvador Island, Acklins, Crooked Island, Exuma and Mayaguana. All the islands are low and flat, with ridges that usually rise no more than 15 to 20m. The highest point in the country is Mount Alvernia with an altitude of 63 meters on Cat Island. One of the most prosperous countries in the Caribbean region, Bahamas relies on tourism to generate most of its economic activity. Tourism as an industry not only accounts for over 60 percent of the Bahamian GDP, but provides jobs for more than half the country's workforce. After tourism, the next most important economic sector is financial services. Bahamas is one of the richest countries in the Americas. Bahamas debuted in Miss World 1966 and reached the semifinals in 1992 and 2010. 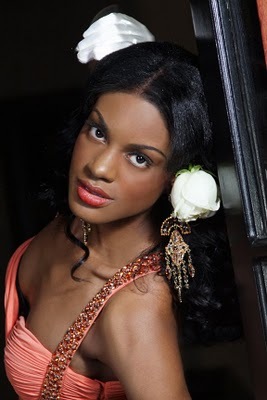 Sasha Celesie Joyce, Miss World Bahamas 2011, will represent the archipelago in Miss World 2011. The Times of Beauty proudly presents Sasha Celesie Joyce, Miss World Bahamas 2011, in an exclusive interview for our interview series, Meet the Misses. Hello World! My name is Sasha Celesie Joyce. I am 22 year old Bahamian (born and bred) and I come from what some people consider a big family. Like the size of my family, I'm a young lady with big dreams and hopes and I'm determined to make them all a reality. The Bahamas is such a unique and diverse country. Most people don't know this, but we have more than 700 islands and cays; although only about 30 of these islands are inhabited. One unique aspect of our culture is Junkanoo, an explosive festival celebrated only here in The Bahamas. Our diversity can be experienced through these islands, which each have their own sub-culture and the geographical structure. There is always something new to see and explore in The Bahamas. It's an honor to represent my country. I am allowed to show the world the beauty that lies within The Bahamas. Not only physically, but intellectually and emotionally as well. If I had to choose one song, it would be Can't Give Up Now by Mary Mary. It shows my persistence and attitude toward life and any shortcomings I may encounter. When I want something I go for it with everything I have. I don't want to look back at my life and say 'I should have done this or tried that'. Apart from making appearances as Miss World Bahamas, my typical day in my life would just be relaxing with my family. We would all sit around, pop in a DVD and watch a movie. Something comfortable and homely. Wow 10 years!!!. There is so much I want to do within that time. I want to be able to look back at my life and proudly say that I've accomplished everything I set out to do in that time frame and be happy about it. There are actually two people, and I can't choose between them!! Her Excellency Dame Ivy Dumont and The Honorable Cynthia "Mother" Pratt. Both women have been influential figures in the Bahamian society for young ladies; being the first Bahamian women to ever hold the prestigious titles of Governor General and Deputy Prime Minister respectively. They showed us that if we put our mind to it, anything is possible. I have heard so many great things about London, England; from its cultural diversity to its history. So another country I would choose to live in would be England; and it helps that the Bahamas has a strong British influence so I won't feel far from home. The earthquake in Japan was a very unfortunate event to have happened to that country. Although it brought the world together as a brotherhood, it also made us realize the importance of finding alternative methods for energy and safeguarding and conserving those energy methods already in place. The worst kind of prejudice happening now in today's society would be stereotyping. People should get to know others personally instead of arriving at a conclusion based on the race, cultural background, or even religion of that person. 11. What are your duties as Miss World Bahamas? My duties as Miss World Bahamas is to be an ambassador for my country. 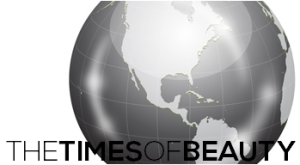 To bring awareness both nationally and internationally to people as to what The Bahamas is about. It's about being an inspiration to our Bahamian youth, to be proud of their heritage and culture. To want to be better for themselves and their country. Social media can actually be a plus in the life of a pageant holder. Since these networks are international, they allow fans from round the world to follow-up on the life of their favorite titleholder. It gives you so much more exposure when used correctly. As a human beings we are classed as the superior species. We are able to drastically change the world for better or worse. Since we have that power, we should use it positively for man-kind, animal-kind and our world in general. I feel that my purpose in life is to be an inspiration to others. Not only by what I say but but by being that positive example by how I live my life. I would like to thank all of my supporters and readers of The Times of Beauty for taking time out to read this article to get to know me as a person. It's great to know people are behind me supporting me and it gives me a greater incentive to go out there and do my best. Personal Motto: Why take second place when first is open. If you do this you'll have a tendency to do it for the rest of your life. Personal Goal: To accomplish everything I set out to do and to at least make a positive difference in someone's life.